Lionsgate Home Entertainment has announced the date and released artwork for the thriller, Man on a Ledge starring Sam Worthington, Elizabeth Banks, Jamie Bell, Anthony Mackie, Genesis Rodriguez and Ed Harris. Click on the link below or image to the left to check out the features and artwork. An all-star cast in an intense action-thriller comes home when Man on a Ledge arrives on 4K Ultra HD Combo Pack (plus Blu-ray and Digital) April 9 from Lionsgate. Starring Sam Worthington, Elizabeth Banks, Jamie Bell, and Anthony Mackie, the film has been called “a heart-pounding adrenaline rush” by Fox-TV. Experience four times the resolution of full HD with the 4K Ultra HD Combo Pack, which includes Dolby Vision HDR, bringing entertainment to life through ultra-vivid picture quality. When compared to a standard picture, Dolby Vision can deliver spectacular colors never before seen on a screen, highlights that are up to 40 times brighter, and blacks that are 10 times darker. Additionally, the 4K Ultra HD Combo Pack and Blu-ray feature Dolby Atmos® audio mixed specifically for the home, to place and move audio anywhere in the room, including overhead. 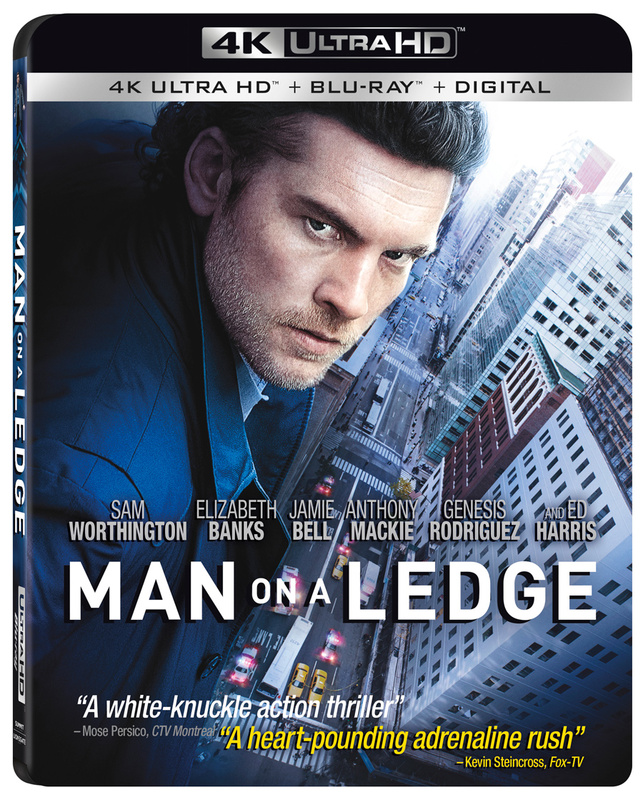 Available for the very first time in this absolutely stunning format, the Man on a Ledge 4K Ultra HD Combo Pack will include a featurette and trailer commentary by Elizabeth Banks and will be available for the suggested retail price of $22.99. Ex-cop Nick Cassidy (Sam Worthington) escapes from prison to plan the ultimate heist; steal a $40 million diamond from cutthroat businessman David Englander (Ed Harris), and in the process prove his own innocence. From the ledge of the famous Roosevelt Hotel with the whole world watching, Cassidy plays a clever game of cat and mouse with the NYPD while his dutiful brother Joey (Jamie Bell) races against the clock to extract the diamond and clear his brother’s name.